Ask her what she loves after a concert. If you live in the Chicagoland area and haven't been to one of her concerts, you have missed a treat. She is the kind of person this website likes to feature because she is a hidden gem. Her jazz voice and gesture are all spot on. Admittedly her concerts are a little infrequent to give her the recognition she deserves. Thats because she usually arranges every single facet of her performance from the venue and ticket price to the band and arrangements herself. When we asked her directly after being at one concerts "my God, why aren't you famous?" , she replied that is was expensive to perform and she does a lot of work to get things just right. Recently she surprised us by putting on an R&B concert at DuSable Museum. Although she she is a a jazz vocalist with a little bit of a blues edge, she surprised everyone with a high energy selection of R&B that had the audience singing along at one point. 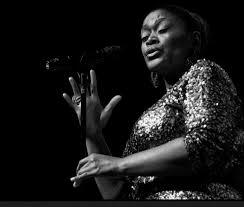 If you can find out where she is going to be next,do yourself a favor and go see this jazz diva. Jennifer Graham in concert at the Jazz Showcase in Chicago with the Bradley Williams 21st Century Review.